The Giving Common - Big Brothers Big Sisters of Massachusetts Bay Inc. Founded in 1949 and based in Boston, BBBSMB currently serves over 3,000 children each year through one-to-one, long-term, adult-child mentoring friendships. BBBSMB serves youth in communities throughout Eastern Massachusetts from Cape Ann to Cape Cod, with the majority of children living in under-resourced urban communities (over half of the children we serve live in the city of Boston). With research and proven outcomes at its core, our organization is working to ensure every child has the support from caring adults that they need for healthy development and success in life. A great example of the impact of our program is the long-term friendship of Adam and Chris. In 2001, Adam (who was then 11 years old) witnessed the shooting death of his 17-year-old brother on a Boston street – the innocent victim of gang crossfire. Adam was traumatized by his brother’s murder, and became distant and withdrawn. His mom, Flora, requested a Big Brother for Adam, and soon after he was matched with Chris. Over time, Adam and Chris developed a deep friendship, and despite all the adversity surrounding him, Adam blossomed. He dedicated himself to his studies, and amazingly, he recently graduated with a degree in Chemical Engineering from MIT! Adam says this of his experience: “You have to understand that where I grew up none of these kids have dads and you definitely don’t know anybody who went to college. When you’re a little kid everybody will tell you until they’re blue in the face that you can do anything you want, but nobody actually believes it. How can you? There’s not a single person in your world you can point to.” Fortunately, Chris became that person for Adam. And while Chris and Adam’s story is truly unique, it is also representative of the hundreds of other success stories from children and families we have served. We recently completed a successful five-year plan that resulted in serving 60% more youth annually; our new multi-year plan will result in continued growth, innovation, and long-term impact. Our current plan reflects the demonstrated need and demand for our services in our service area, as well as our organization’s commitment to provide the best one-to-one mentoring experience in the country, based on outcomes that support positive youth development, for the greatest number of low-income boys and girls at the most efficient cost structure possible. Over the length of the plan, we will increase the number of children served from 2017 (2,700) by 80%, resulting in 5,000 children served annually. We will incrementally increase children served each fiscal year, layering in the resources needed to expand our capacity in a sustainable manner. And this increase in service will be matched with a commitment to service quality and positive outcomes for youth. After a multi-year planning/discovery process, we adopted a research-based framework of positive youth development: Lerner’s “6 C’s Of Youth Development.” In this framework, young people whose lives incorporated the “6 C’s” (Competence, Confidence, Connection, Character, Caring, and Curiosity) are on a developmental path that results in contributions to self, family, and community. Current research strongly suggests that a child’s ability to develop each of the 6 C’s is the best predictor of positive long-term outcomes. The adoption of the 6 C’s framework now contextualizes all of our work. We assess each child utilizing scales derived from validated instruments, establishing a developmental baseline. Staff are trained in the framework and help our volunteers support children using the principles of positive youth development. And we recently developed Salesforce-driven systems to obtain data from volunteers, children and guardians throughout each match. We have also successfully developed and launched an innovative program serving high-school age students. “Mentor2.0” helps low-income high school students in to achieve their dream of a college degree. The program combines our unmatched expertise in mentoring and volunteer management with a model of service developed and proven effective in other major urban school districts. Launched in the 2016-17 school year, Mentor2.0 will support 400 students in 2018-19. A growing body of research demonstrates that under-resourced youth are more likely to overcome these challenges when they have a consistent, caring adult in their lives. The recently published study “The Mentoring Effect” by the National Mentoring Partnership showed that young people with formal and even informal mentors in their lives were far more likely to stay in school, enroll in college, become active in sports, become leaders and generally pursue higher goals in their lives. And a recent report published by Child Trends noted that “in all cases having a mentor was significantly associated with positive well-being—that is, with a greater likelihood of positive outcomes, and reduced likelihood of negative outcomes.” At the same time, children living in low-income, single-parent homes in under-resourced neighborhoods are far less likely than their better-resourced peers to be associated with a caring adult other than a parent. We conducted a comprehensive analysis of our service area to determine the number of children meeting our most basic criteria for service and determined that roughly 10,300 additional at-risk children between the ages of 7-12 are currently not matched in a one-to-one mentoring relationship and could greatly benefit from a mentor. Every day I spend as President & CEO of BBBSMB, I am privileged to experience the power of mentoring and the opportunities it makes possible for children facing adversity. By supporting Big Brothers Big Sisters, you’re investing in the potential of the more than 3,000 children we’ll serve this year. That’s a great start! But our work is far from done. Thousands more kids still need our help, and there are so many ways you can get involved. I am excited to tell you that I'm a Big Sister myself. My Little Sister’s name is Shanell. She’s 10 years old and just adorable--under 5 feet tall (but not for long! ), skinny as a bean pole, with a smile that goes from ear to ear! I can’t imagine a better match; she’s smart, high energy, and funny. We get together every Friday, which we’ve renamed “Friend Day.” We do things like play board games, do crafts, decorate cookies, and trade jokes. I thought I knew everything there was to know about our program. But I’m amazed how much being a Big Sister has changed me. A year ago, I didn’t even know Shanell existed; now I wonder about her constantly. What’s she doing? Did she have a good weekend? How did she do on her spelling test? Ever since we met there’s a 10-year-old who has become a part of my heart. … and who breaks my heart at the same time. Recently Shanell’s teacher pulled me aside to let me know she’s concerned. She’s failing math, she’s not writing at grade level, and she’s acting up in class. Her family situation is chaotic and too frequently results in her being absent. She isn’t getting the support she needs at home to put in the extra work where she needs it. Yet her teacher says she is bright, motivated, and wants to do well. I think about what Shanell is up against and compare that to all the support I had growing up, and I am even more motivated to be a constant presence in her life and ensure that the thousands of other children like her get our help. No matter what kinds of adversity our Littles face, a Big Brother or Big Sister makes a BIG difference. The simple fact is that the more support a child has from adults, the more likely they are to succeed in life. And while I can’t tell you yet what the outcomes will be for Shanell, I can tell you I’m absolutely committed to doing whatever I can to help her reach her full potential. Please consider becoming a Big Brother or Big Sister. Encourage your friends or employees to check us out. Make a donation if you haven’t already. Volunteer your skills to help us reach more children - and imagine the impact we can make together. Thanks to the commitment, time and generosity of our supporters, we'll serve over 2,100 youth this year with our gold standard youth mentoring programs. We will also match hundreds of new Littles with caring Bigs of their own, while also piloting exciting new programs and partnerships to reach more children, increase our impact, and deepen our outcomes. Through your support, we can help children who are facing adversity beat the odds. Together, we are changing childrens' lives for the better, forever, and transforming our community one child at a time by contributing to healthier families, better schools, and brighter futures. We look forward to growing our partnerships with all our supporters as we work together to make a real difference in our children and communities. BBBSMB serves the city of Boston and surrounding suburbs of Greater Boston, as well as most towns on the North Shore, Metrowest, South Shore, Greater Attleboro, and Cape Cod and the Islands. Our primary focus is on serving youth living in under-resourced urban communities. In our programs, volunteer mentors (“Bigs”) are paired with children (“Littles”) in one-to-one relationships called “matches.” Community-based matches plan activities of their own choosing on their own time. Our Community-based program appeals to volunteers who can commit to meeting with a child during weekends or after work/school. Research shows that a match of just one year helps kids stay in school, avoid violent and risky behavior, and gain confidence. Youth involved in the BBBSMB program become more adept at having quality relationships with adults, which contributes to their abilities to advocate for themselves throughout life. Children who have Big Brothers and Big Sisters are more likely to graduate high school, attend college, establish successful careers, break the cycle of poverty in their families, and contribute to the vibrance of their communities. BBBSMB’s vision is to inspire, engage and transform the communities of Mass Bay by helping youth achieve their full potential, contributing to healthier families, better schools, brighter futures and stronger communities. BBBSMB utilizes the Youth Outcome Survey (YoS), a norm-referenced child development survey developed by Big Brothers Big Sisters of America in partnership with several of the most prominent researchers in the mentoring field. To measure the impact of Big Brothers Big Sisters mentoring on the lives of youth, the YoS is conducted prior to the child being matched and at one-year intervals thereafter. The YoS measures child involvement with alcohol and substances as well as multiple other aspects of youth development. BBBSMB also utilizes the Strength of Relationship (SoR) survey - which is administered with children and volunteers in the fourth month of their match to ensure that their relationship is progressing as expected; the SoR helps our team to determine which matches require additional professional support. All data and narrative information about each match is captured via our Agency Information Management (AIM) system, an online platform hosted by our national organization. We have a special focus on serving children living in housing developments operated by the Boston, Cambridge and Somerville Housing Authorities. At each development, we offer programming designed to meet the specific needs of youth in that community. For example, at Franklin Field (Dorchester), children are transported by bus from Franklin Field to the Boston College campus, where they meet with their Bigs. Thanks to our partnership with the college, all Bigs are BC students and matches can utilize a variety of on-campus resources (including the fitness center and recreational facilities) to engage in fun and educational activities. One unique benefit of this program is that the children get to experience a college campus - an opportunity to view a higher education institution first hand. Another tremendous benefit is engagement in positive activities for five hours on Saturdays, contributing to their development and eliminating opportunities for negative activity choices. BBBSMB utilizes the Youth Outcome Survey (YoS), a norm-referenced child development survey developed by Big Brothers Big Sisters of America in partnership with several of the most prominent researchers in the mentoring field. To measure the impact of Big Brothers Big Sisters mentoring on the lives of youth, the YoS is conducted prior to the child being matched and at one-year intervals thereafter. The YoS measures child involvement with alcohol and substances as well as multiple other aspects of youth development. BBBSMB also utilizes the Strength of Relationship (SoR) survey - which is administered with children and volunteers in the fourth month of their match to ensure that their relationship is progressing as expected; the SoR helps our team to determine which matches require additional professional support. All data and narrative information about each match is captured via our Agency Information Management (AIM) system, an online platform developed and hosted by our national organization. A 2009 study byHarris Interactive of alumni Littles found that BBBS gives children a better foundation for life success by providing educational and life guidance. BBBSMB was recently selected by iMentor as its exclusive Massachusetts service partner. iMentor is an innovative non-profit with a nationally recognized mentoring model designed to help at-risk high school students succeed in college and beyond. Through the iMentor model, we will assist struggling public high schools by providing every student in our partner schools with a mentor, and we will integrate this community of mentors with existing supports in each school to create a college-going culture. The iMentor model also utilizes a powerful technology platform to enhance personal relationships through online mentoring. Through the iMentor model, we will help local public schools to increase their graduation rates, and help children in these schools to graduate high school and succeed in their pursuit of a college education. iMentor currently serves over 5,000 children in at-risk schools nationally, and is achieving impressive results: 97% of iMentor high school seniors completed college applications, 75% of iMentor's recent high school graduates enrolled in college (compared with only 50% of low-income students nationwide), and 83% of iMentor students who entered college persisted into their second year (compared to the national average of 66% for first-generation college students). In addition to tracking student academic progress (through iMentor's proprietary software), we will also track each child's social-emotional development through use of the Youth Outcome Survey (YoS) -- a norm-referenced tool developed by our national organization in conjunction with several of the most respected researchers in the field of youth mentoring. iMentor currently serves over 5,000 children in at-risk schools nationally, and is achieving impressive results: 97% of iMentor high school seniors completed college applications, 75% of iMentor's recent high school graduates enrolled in college (compared with only 50% of low-income students nationwide), and 83% of iMentor students who entered college persisted into their second year (compared to the national average of 66% for first-generation college students). In our programs, volunteer mentors (“Bigs”) are paired with children (“Littles”) in one-to-one relationships called “matches.” School/site-based matches meet for an hour at the student's school or after-school program. This program is popular with professionals who work in the cities of Boston and Cambridge (where we partner with a dozen schools) who want to mentor a child but whose schedules may prevent them from volunteering on nights and weekends. In most cases, BBBSMB collaborates with employers, who offer the flexibility to their employees to make time during the workday to meet with their Little Brothers and Little Sisters. A 2009 study byHarris Interactiveof alumni Littles found that BBBS gives children a better foundation for life success by providing educational and life guidance. Workplace Mentoring is a version of Big Brothers Big Sisters’ classic one-to-one mentoring program. This program is unique in that students from a local school meet with their mentors at their workplace. Children in these programs not only have a new adult friend and role model, but are also exposed to a positive professional work environment - something they may never have experienced before! A survey conducted by Walker Information proves corporate volunteering programs increase employee desire to stay with a company. Their research shows employees are 20% more likely to stay with a company for at least two years if they have a positive view on the company’s volunteer efforts. Further, LGB Associates, a philanthropic advisory group, found implementing a volunteerism program helps recruit new employees and boost morale. As of 2012, this organization switched their reporting practices for their special events revenue. Revenue from special events is now solely accounted for under revenue and event costs are no longer accounted for under expenses. The financial analyses performed for past years’ financials have been altered to reflect this change and to maintain consistency in reporting financials on the organization’s Giving Common profile. Our vision is to inspire, engage and transform the communities of Massachusetts Bay by helping youth achieve their full potential, contributing to healthier families, better schools, brighter futures and stronger communities. Our program enrolls children (ages 7-12) living in low-income, single-parent families, and we match these youth into long-term friendships with caring, qualified adults. Research shows that children who are in Big Brothers Big Sisters mentoring relationships for at least one year make positive youth development gains, stay in school and have increased academic performance, and avoid risky behavior (such as criminal behavior and drug use). We understand that simply serving a greater number of children served is not an outcome in itself, and the the increase in our capacity is only significant if it produces an increase in our overall impact on these children's lives. To ensure that we achieve increased impact, we are maintaining (or exceeding) our high standards of quality as we grow. Among the most important metrics for quality mentoring relationships are match length (how long a mentoring relationships continues to meet regularly) and match retention (how many matches last for at least one year). 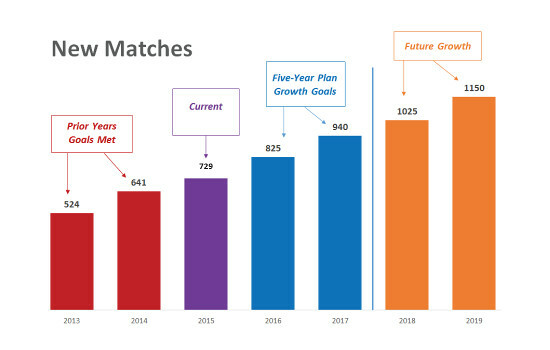 In both of these metrics, BBBSMB is among the highest performing agencies in the nation, with an average match length over three years, with more that 80% of matches lasting at least 12 months. In addition to these metrics, BBBSMB has taken on a leadership role in the mentoring field to identify key programmatic outcomes that clearly lead toward long-term success for the children we serve. BBBSMB is working with nationally recognized researchers and field experts to develop outcome measures, data collection systems and data analysis/evaluation systems that will transform our agency to a fully performance-managed organization. The ultimate goal of these activities is to quantify our most important outcomes -and manage our programs toward these outcomes - to maximize the positive impact on each child we serve, such that they can realize their true potential. To achieve our goals, our plan includes a comprehensive framework for fund development, board and volunteer engagement, recruitment and outreach, and talent management. Each of these areas of focus will be connected and integrated through innovative new technology systems, and contextualized by our efforts to drive productivity and efficiency across core processes. BBBSMB maintains a strong infrastructure and robust external networks that will enable us to achieve our goals. Our internal leadership team consists of professionals who are respected nationally and locally. President & CEO Wendy Foster is a national leader in the Big Brothers Big Sisters national network, and drives our innovation and success locally. Chief Financial Officer Ken Lee, who also serves as the Treasurer for the Greater Boston Food Bank, is tasked with developing and implementing our agency's operational strategy for growth. Nora Leary, or VP of Program Services, has over 20 years experience in leading and managing dynamic human services agencies. Richard Grief, our VP of Community Engagement (formerly VP of Marketing with the Massachusetts Mentoring Partnership), is tasked with recruitment of volunteers and youth throughout our service area. And Mark O'Donnell, Chief Development Officer, is tasked with the implementation of a growing, sustainable fundraising plan. Through their ongoing contribution of skills, time, networks and financial resources, members of the BBBSMB Board of Directors serve as the primary volunteer leaders who advance the agency's growth and good works. Each Board Member makes BBBSMB one of his or her top philanthropic priorities. As a group, the Board establishes agency policy, sets strategic goals, and hires, supports and annually evaluates the President and CEO. Board members also actively work on at least one Board committee or task force, and participate in and support as many of the agency's major fund raising and mission events each year as possible. Members of the Big Brothers Big Sisters of Massachusetts Bay Board of Overseers serve as ambassadors of the organization with a goal to increase financial and community support for the organization. Board members include local business leaders (such as Chairman Jeff Leerink of Leerink Partners, and Peter Markell of Partners Health Care), prominent human services professionals (such as Michelle Gougeon of McLean Hospital) and other community leaders. BBBSMB has developed an extensive (and growing) network of private funders - including corporations, foundations, federated giving sources, and individuals - whose combined strength and commitment to our mission and principles enable us to grow strategically. BBBSMB partners with hundreds of area public schools, businesses, educational institutions, and other non-profits to enable greater outreach to youth, streamlined recruitment of volunteers, acquisition of funding resources, and the development of a knowledge base that informs best practices across all aspects of our operations. We have supported tens of thousands of youth over 70 years, and continue to innovate to provide the best mentoring experience in the nation. After a multi-year planning/discovery process, we adopted a research-based framework of positive youth development: Lerner’s “5 C’s Of Youth Development.” In this framework, young people whose lives incorporated the “5 C’s” (Competence, Confidence, Connection, Character, Caring) are on a developmental path that results in contributions to self, family, and community. Each “C” can be observed and measured over time; by observing each child’s developmental progress through the lens of the 5 C’s, we can – regardless of age, or where the child lands on the developmental spectrum – measure their progress. Based on current research, we believe that a child’s ability to develop each of the 5 C’s is the best predictor of positive long-term outcomes.